HORAN Capital Advisors Blog: The Sentiment Cycle Phase: "Buy The Dip"
Aside from fundamental market data, the equity market tends to follow a sentiment cycle as described by Justin Mamis, a famed market technician and author, who wrote several books on technical analysis. One of his books, The Nature of Risk, contains a discussion on the equity market's sentiment cycle. Below is The Sentiment Cycle chart included in The Nature of Risk. In The Nature of Risk Mamis notes the market sentiment cycle begins with stocks climbing the proverbial "wall of worry." In a post I wrote in July 2009, Where Are We In The Market Cycle?, I noted the market seemed to be coming out of the financial crisis and had moved into this "wall of worry" phase of the sentiment cycle. Then in June of 2014 I noted in a blog post, VIX Is Low But Investors In Denial Stage Of Market Sentiment Cycle, I surmised the market was likely in the "denial" phase of the sentiment cycle. Today, I believe we are in or near the "buy the dip" phase of the market sentiment cycle. 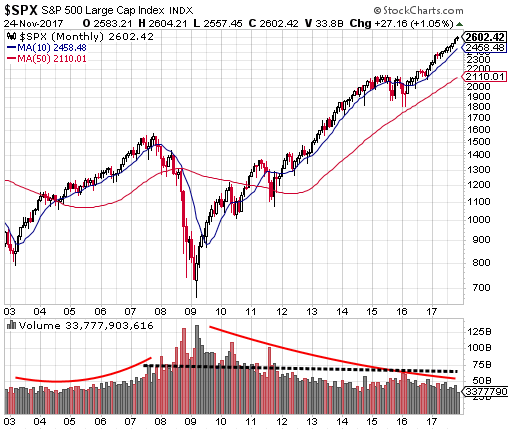 One missing aspect with the market today is the lack of slowly increasing trading volume like occurred in the run up to the market top in 2008 and seen in the above monthly market chart. However, the lack of any significant market pullback since mid year 2016 is certainly representative of investors being content with "buying on the dips." The sentiment cycle length seems to be an extended one in this bull market cycle and we can list any number of reasons for the extension. However, from a sentiment and technical perspective, this cycle, although long in duration, likely has further upside as buying "enthusiasm" seems absent. A confirming enthusiasm data point would be increasing volume into a so called blow off top. I think investors would have a hard time arguing against the fact that "buy the dip" is prevalent in recent stock market action.